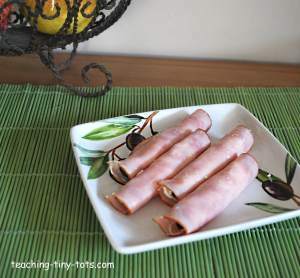 Toddler Recipes: Easy Snack Ideas for Kids! Put the cheese onto the parchment paper and spread it into a flat circle. Place in the oven for 5-6 minutes. Break into small pieces to sprinkle on salads or eat as a snack. 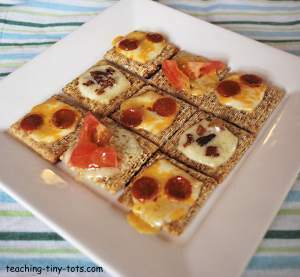 Place triscuits on paper plate to microwave or foil lined tray for toaster oven. Place square of cheese or small pinch of shredded cheese on each triscuit. Top with pepperoni, tomatoes, bacon bits, olives, etc. Yummy snack! Always check it is the right temperature for your child to eat. Place slice of ham or turkey on plate. Spread some cream cheese on the ham. Roll up and cut up into pieces. Great party snack idea. 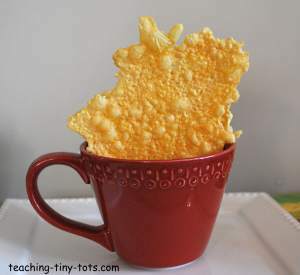 Easy to make and fun to eat.